Mr. Chill... Sweeps and Charms on a Blustery Eve! It's always a huge thrill for me when I get an email with a photo of a rug someone has hooked using one of my patterns! Today I received this photo from Glenda B. in Trion, GA who has just finished hooking "Mr. Chill"! "Well here he is ! I have not began the dyeing process so all my wool is off the bolt. With that being said that is why I was unable to do a light background like I wanted to, I just could not find any wool in my small stash that would work! This is my 2nd rug. it's amazing how this little man has such a personality, hopefully the next time I will have some pretty golden wool for a light background!" Well Glenda, I think it's amazing how wonderful you have interpreted the pattern and for your second rug it's even more amazing! I LOVE the dark background and the way you've hooked stars into the night time sky! It goes to show with some creativity a person can hook a fabulous rug using the wool you have on hand. It's always nice to have that hand-dyed wool so most of us at some stage in our hooking careers dabble in the dye pots! But it all comes in time and shouldn't stop one from hooking a rug with whatever you have on hand. 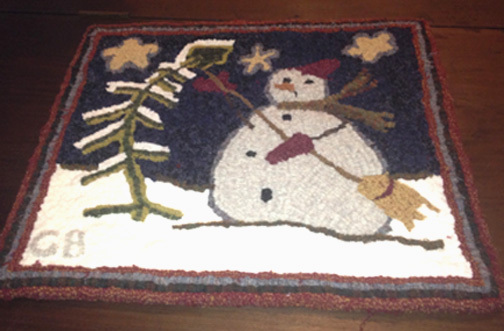 Glenda's rug is certainly a testament to what can be accomplished! Not once, not twice.... but thrice! Tonight I am starting to hook my THIRD Mr. Chill rug! He's going to a home that is eagerly awaiting his arrival! The pattern is drawn on the linen and I will be pulling some loops on it tonight! What better way to spend a cold and blustery end of January evening! I hear Dave throwing another log in the wood stove downstairs! Fire that baby up! I need all the heat I can get while hooking this chilly little guy tonight! I hope mine turns out with all the charm and personality that Glenda's has! Lisa's Latest Rug and Looking Forward! I want to share a glimpse of the rug my friend Lisa is working on! Another version of the antique rug some call Clover Buds in Basket. Some day I hope to hook this one myself! I'm loving the color choices we picked for this one! Remember her first rug was hooked with a dark antique background. I'm keeping busy here in the studio preparing for my next beginning rug hooking class at WITC our local technical college. There are nine lovely ladies waiting patiently for class to begin! There's room for a couple more if you have been thinking about giving rug hooking a try! The project I have planned for them is in progress and I think they will love it! I don't want to spoil the surprise by showing you the project just yet.... I know some of the students are reading my blog! 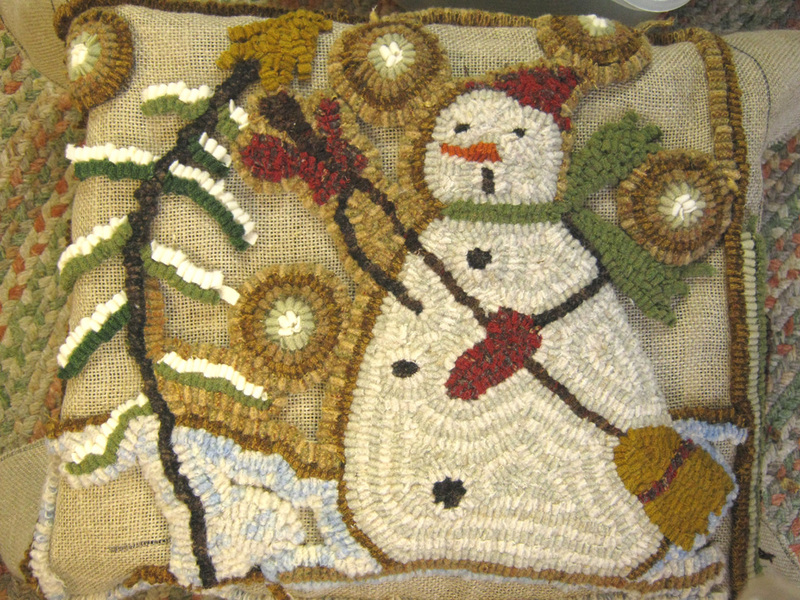 Also keep an eye out for an applique class that Jill will be teaching here in the studio in a few weeks. The model she is working on for the project is awesome! I hate keeping all these secrets from you! But then again it's good to have something to look forward to! When the temperatures drop double digits BELOW zero here in the Northland of Wisconsin you never hear people talking about it much. It doesn't seem like any big deal to us! Good grief.... it's not because our brains are frozen... at least some of us.... LOL! It's because we've lived through what I think was a record set a few years back. The temperature actually dropped to 60 degrees BELOW zero here! Any body remember that? All I will tell you is that I was out and about that night. Yes indeed. Maybe for lack of brains or frozen ones I don't know which. We laugh about it now. I'd like to believe I'm a little wiser in my old age and if the temps are predicted anywhere near zero let alone below, I make plans to not venture beyond the warmth of the wood stove and my electric heated studio! At 7:00 am this morning when Dave went out to start his truck to go to work the thing sounded like he was trying to stab it with a knife! LOL! The engine groaned and groaned and when it finally turned over he said it sounded like one of those old time noon sirens that small towns around here still have. ( Rice Lake used to have one). They wind up to a high screaming pitch then wind down... and down.. slowly through all the octaves. His poor truck is getting on up in years too so I can't blame it for screaming out in protest this morning when it would rather have stayed put to slowly unthaw in the morning sunshine. 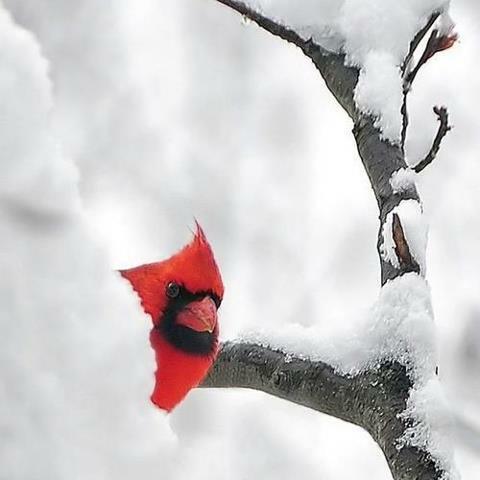 So..... feeling kind of chilly already?! LOL! I have something that might warm you up a bit! 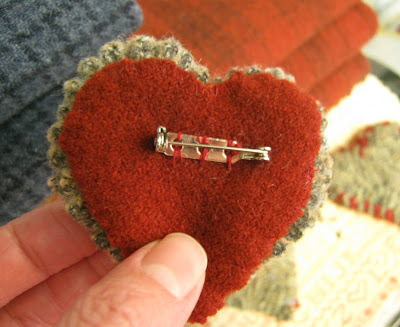 The little warm and wooley heart in the photo above is a little hooked heart pin that wants to arrive in your mail box! I've been hooking these little things these past few days and I've offered a few for sale last Friday over on Primitive Handmades Mercantile. This little gray one is so cute! The back is lined with red wool! If you leave a comment and a way to reach you if you don't have a blog I'd like to put your name in the hat to win this little guy! I want to have a more substantial give-away soon but thought this would be fun to pop in the mail and you'd get it in a day or two! I'll pick a name Tues. or Wed.
You can wear it near your heart or on your sleeve! LOL! Or sit it on a shelf!! You know that old saying...... the behinder I get! . That's the way it's been here lately as I dig my way out of mounds of paper work for the taxes, preparing for upcoming rug hooking classes, finishing orders and oh my goodness is it time for Primitive Handmades Mercantile update tomorrow already? Lordy... another saying comes to mind.... No rest for the wicked!! LOL! I must be the wickedest witch from the North! I want you to know however that I've parked my broom long enough to stitch up something to offer over on the Merc. tomorrow! You can catch a glimpse of something wooley in the above photo! 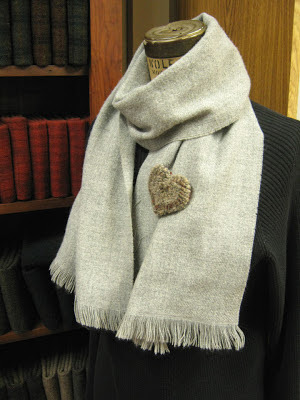 There is a lovely give-away brewing over on the Mercantile this month also! 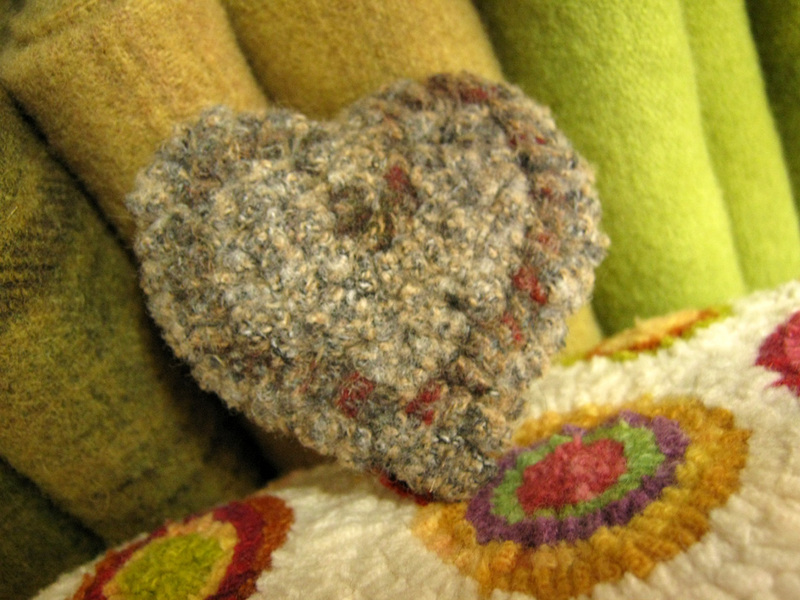 Hope you can swing over and catch your heart's desire from the many "love"ly offerings! 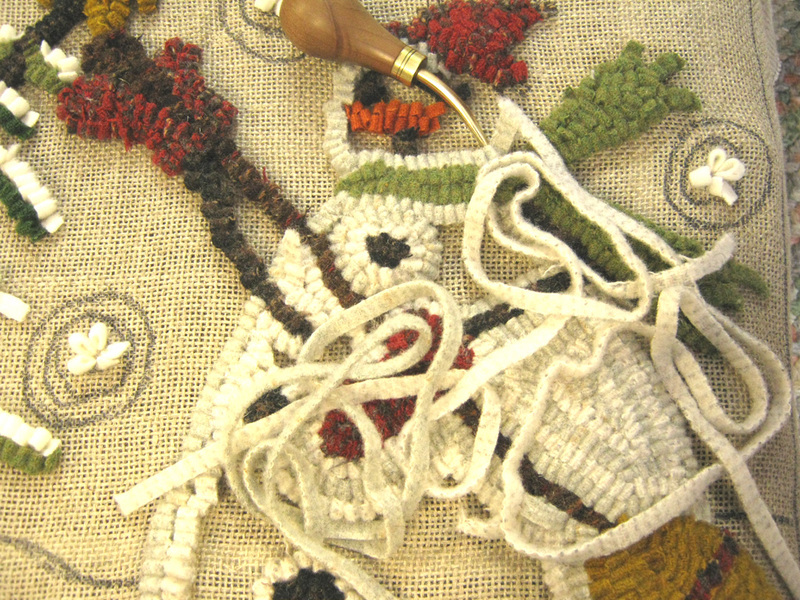 That rug up there in my header photo is one of my very early designs... in fact I hooked and designed it the same year that I started hooking. Never mind the crooked edges and tight hooking! I have it hanging over an antique walnut gentleman's chest in our bedroom. It reminds me daily of my love for hooking and how far I've come with my efforts to share and teach it to others! My upcoming class at our local technical college already has 9 lovely ladies signed up! There's room for a couple more! So be quick if you are thinking about taking the class. Call the school at 1 800 243 9482 ext. 5409 or 5410. I better get back on the broomstick and get my update started over at Primitive Handmades Mercantile! VrooooooooM!!! 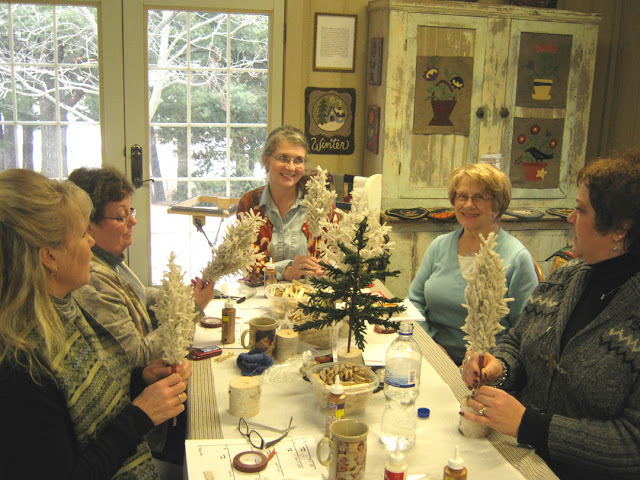 Our First Wool Feather Tree Class! The prettiest little bags all personalized and ready for the participants of our first feather tree class here at the studio today~ Jill designed these bags with both of our business names. 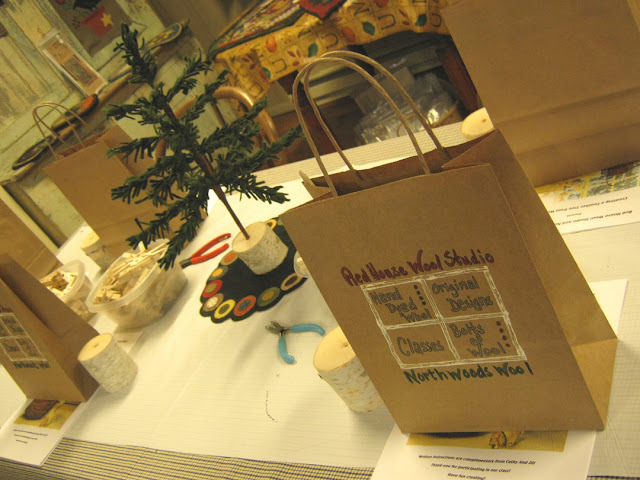 She hand decorated each bag! Then..... poor Jill had to come down with the flu! Drats! She wasn't feeling all that well yet today so decided to stay home and rest! A couple more gals who wanted to take the class had the flu also! I am proud of these gals for staying home so as not to pass the flu bug to the rest of us! But those who attended were so enthusiastic it sounds like we will be having another class soon! They want to make MORE trees!! What a blast we had! 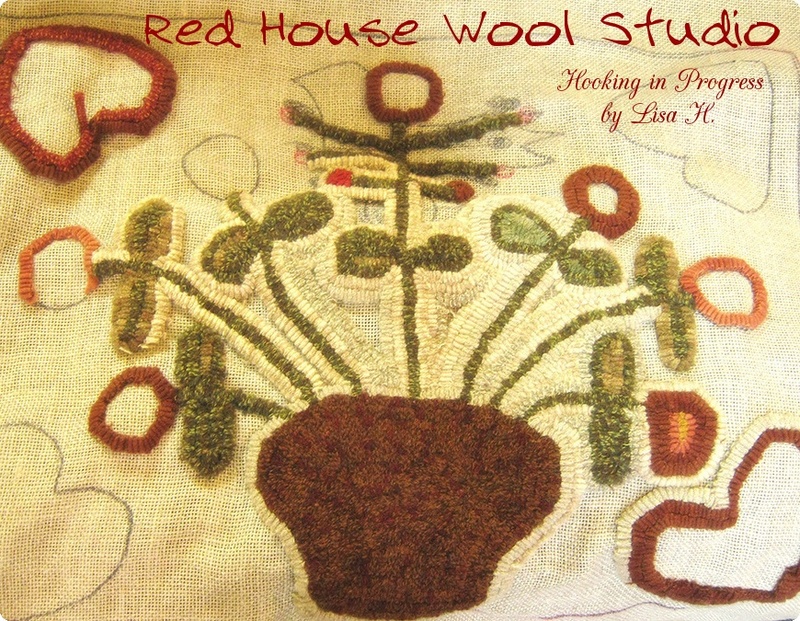 The wools was a flying and the girls did plenty of buying of wool for their rug hooking and other projects! Here is a peak of the table before the class started! I forgot to take pictures while we were in the actual construction stage of the trees. But here they had completed their trees and were saying how they thought they looked so much like feather dusters! I told them "you can go look for cob webs if you like!" LOL! Every one decided on an off white textured wool for their trees! Good job ladies! Now let them dry overnight before you open them! Left to right: Lisa, Penny, Heidi, Lorena and Vicki! Vicki is our newest friend and one talented crafter! She owns a little primitive shop north of here a few miles called Simply! It is one fantastic little shop! She hand crafts a lot of the items she sells along with antiques and primitives. Her shop is seasonal and opens in May through Oct. I'll bet you'd like to see some photos of her place when she reopens for this summer season! Thank-you girls so much for all the fun we had today and all the enthusiasm you have for things yet to come! It's going to be a busy Spring here in the studio! Some things I will share with you when I get rested up a bit and get my taxes done! It's going to be a super cold week here in Wisconsin. I hear some below zero weather is on the way! A good week to get the dye kettles boiling and work on the taxes. I have to find out if I've gone over the fiscal cliff here in the studio! We Heart Our Local Animal Shelter! Making progress on a Mr. Chill rug for a customer! I had forgotten how dog-gonned fun this rug was to hook! I have to commend our family for bringing an item to donate to our local animal shelter when we gathered this year for Christmas! We don't exchange gifts but each family brings something the shelter is in need of! All things they can always use and need more of. Check the local websites of your local animal shelters to see what they are currently in need of. Tough economic times usually means they are low on donations too. 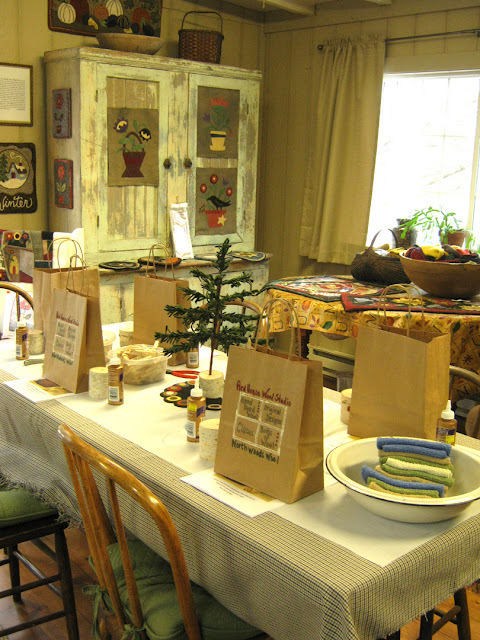 I have a busy week here getting ready for the Wool Feather Tree Class this Sat. We have openings for two more lovely people! If you live near our area and would like to take the class just email me for more info. My Beginning rug hooking class is filling up at WITC that starts Feb. 21st. If you are thinking of taking the class please contact the school pretty quickly! A beautiful piece of wool is like a good friend...Great to have around and always fun to do things with! 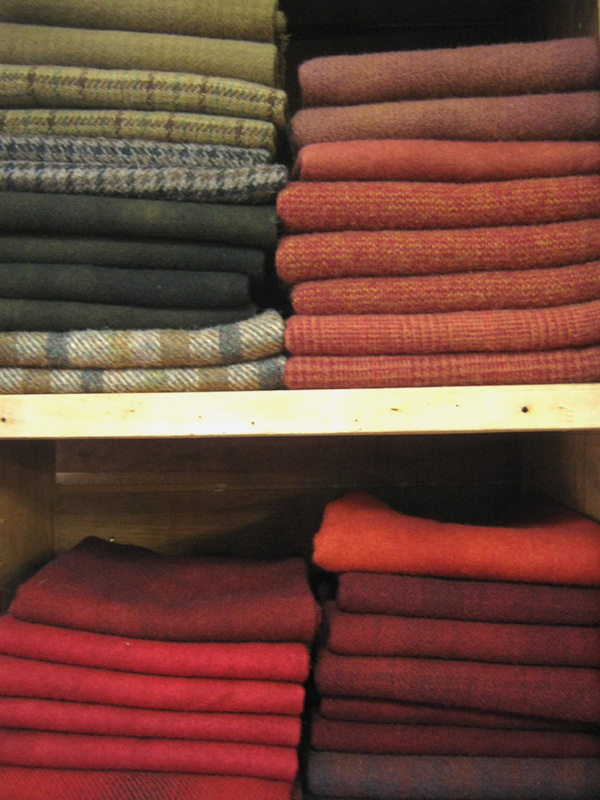 Come January I crave pops of the color red somewhere in my home, work, and especially my wool! My thoughts turn to every imaginable shade of it I could be dyeing for my next hooking projects. Not that there isn't already plenty of juicy red tempting morsels folded on the shelves.... I like the thought of hot steaming kettles of it boiling on the stove. No steaming kettles here today I'm afraid. I have tasks needing attention such as commission rugs to hook, orders needing to be sent and taxes waiting to be calculated. There has been little time to even think about things such as New Years resolutions.